Ifat Glassman: born and raised in Israel. Residing in CA , USA. 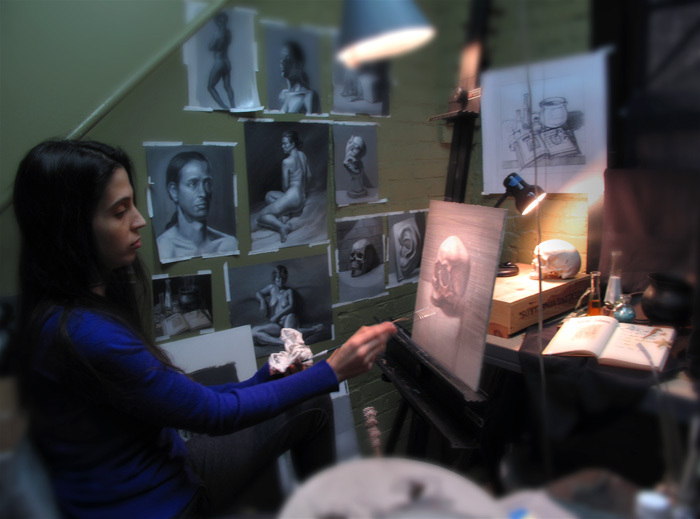 2010-2013 studied art full time at Georgetown Atelier, a private school that focuses on classical realism. I also studied anatomy at The Seattle Sculpture Atelier and attended some sculpting classes. My goal in creating Art is to express my view of the world, of life and of human nature through a variety of things, such as: situations, narratives, facial expressions, body posture/action. My immediate goal is to create a physical object (a painting, drawing etc’) that concretizes abstract qualities that intrigue or inspire me. My favorite philosopher, Ayn Rand, defined this process as: “Selective re-creation of reality according to the artist’s metaphysical value judgements”. 1. Realism (selective realism would be more accurate a description). 2. Maintaining and improving my ability to get inspired and successfully concretize that vision on a piece of paper (or other mediums). I draw and paint from my head as well as from life. My view is that what I see is there to allow me to give physical form to my own vision. Art is creation; not copying. Reality provides the building blocks from which to build one’s unique creation. We therefore imitate parts and aspects of reality, but those are put together creatively to communicate a unique vision. As an artist my job is to take from my subject matter what makes my vision real and disregard the aspects which are irrelevant to it. Through this process I create reality as seen and understood through human eyes; with areas of higher or lower degree of detail, with emphasizing light and color according to how I experience the mood of a piece – it is realism that serves a vision and is subjugated to it: a refinement of the raw sense-data into something closer to how reality is experienced through human eyes, who filter it out with intent and according to a theme, mood or goal. In addition to painting and drawing, I teach art privately and occasionally hold classes, as well as model for figure drawing sessions and for artists privately. I hold an engineering degree in Biomedical engineering from Technion (an institute of Technology in Israel), but I did not pursue engineering as a career in order to train as an artist. It did, however, change the way I think and enhance it. My blog contains both my work from my 3 years at the atelier as well as new pieces. I write about my thoughts on art from a philosophical, psychological and technical points of view. This blog is essentially a documentation of my creations and thoughts. Subscribe via email to receive my blog posts (a lot of thoughts written down) or Facebook if you want to see a lot of images of work in progress, short or imaginary drawings, studies and short ideas that I often post on my Facebook art page. Thank you for your interest and I’m glad to have you as a reader.